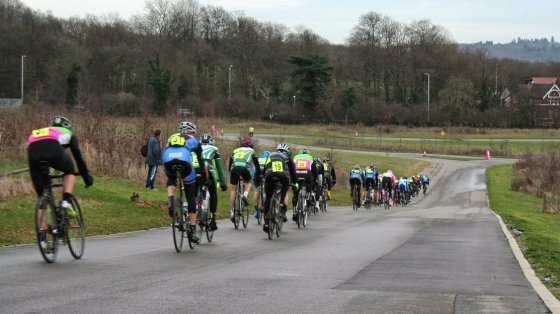 Gunther Zechmann (London Phoenix) secured victory in the 2/3 cat race for a second consecutive week at the East London Velo Series at the Redbridge Circuit in Essex. After a damp morning the strong breeze started to dry the circuit out a bit by midday, it also helped push the riders up and over the Hoggenberg, though they had to contend with crosswinds at the bottom S bends. Though conditions obviously weren’t too challenging as there were some fast lap times recorded in both races. 43 riders lined up for the higher category race including last week’s winner Zechmann. It was good also to see David Mclean making a low key return to racing after a long period off the bike. The pace of the race looked fast from the off but the tailwind up the Hoggenberg seemed to be helping keep things together and despite some big digs by Jack Finch and ELV’s own Jason Jeffers it took a few laps until Edmond Bradbury managed to put some daylight between himself and the compact bunch. Bradbury was soon joined by Zechmann, who clearly wasn’t going to let anything go, and a lively looking Finch. Kieran Brady was driving the bunch at 20 seconds. By the halfway point it was Zechmann and Bradbury who’d gone clear and with the other riders seeming to lose interest behind they quickly grew the gap to over a minute. Finch, Will Hayter and Jonnie Blackman then seemed to lift the pace behind and the bunch started to line out and break up with eight riders going out the back immediately. It wasn’t enough to make inroads on the two leaders though who continued to ride away. With less than 20 minutes racing left Zechmann and Bradbury had two minutes’ advantage over a group comprising Blackman, Hayter, Brady, Finch and the North Road pairing of Frank Rawlins and Colin Bailey who had measured their effort well. This group had 30 seconds on the bunch. With two laps to go Zechmann powered away from Bradbury and eventually caught and lapped the bunch, taking his second win courtesy of a 2:54 lap on a windy day and on a very soft rear tyre. Bradbury took an excellent second with Hayter getting the better of his breakaway companions for third. Patrick Martin was first to finish from what was left of the bunch. 51 riders lined up for the fourth category race over one hour. There was an early crash involving half a dozen riders but fortunately there were no serious injuries and all but one rider (who suffered a mechanical) continued. Most of the action seemed to be at the back of the race with the bunch reduced to around 30 riders after less than 20 minutes of racing. As it turned out the stronger riders were biding their time. Terry Lynch and Callum Hasler were pushing the pace at the halfway mark but neither they nor anybody else could make a move stick. With five laps to go James Batten was prominent at the front along with Alex Blomeley and Hasler again stirring things up. With two laps to go Blomeley had established a 10-second advantage chased by Hasler and Mike Smith. At the bell he had stretched out his advantage very slightly with Smith and Hasler being joined by Batten in pursuit with the bunch of around 15 riders a few seconds back. On the line Blomeley had a clear advantage and could take the time to enjoy his win.